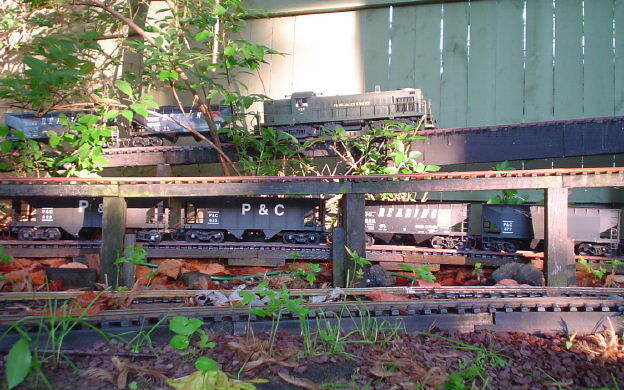 Often our garden railroad tracks have to climb up and down hills, just like the real railroads. This can make for some real challenges. How steep can it be? How does this affect the trains? First we�ll take a look at how the real railroads deal with these challenges and then how we deal with them in our garden railroads. Many railroads had mountains to cross and had to choose whether to go around the mountains, up and over, or some combination in between. An example of going around is the New York Central�s route from New York to Chicago�the Water Level Route�that avoided the Allegheny Mountains by going north to Albany, then west. The Pennsylvania Railroad went up and over the mountains, building the famous Horseshoe Curve to route trains up to the summit. The New York Central had more miles but the Pennsy had to deal with the grades. In the U.S., grades are described in percent gradient, meaning how many feet rise in elevation per 100 feet of track. A level track is zero percent; a one-foot rise per 100 feet is a 1% grade; a two-foot rise per 100 feet is a 2% grade, and so on. In general, railroads keep their grades as low as possible to keep operating expenses down. Heavy grades take their toll on fuel, maintenance, number of locomotives, helper crew costs, and slower schedules. A long stretch of 1% is considered a heavy climb (the Feather River Canyon for instance), but there are many places where grades are steeper than this. The Pennsylvania Railroad tackled the Alleghenies between Altoona and Gallitzin by winding the railroad around the hills and valleys to achieve more track length. This kept the grade at a manageable 1.75%, but it still requires helpers to this day. The Baltimore and Ohio was not so fortunate. Its West End route from Cumberland, MD to Grafton, WV, had FOUR long, winding grades of 2.2%. The Rio Grande�s main line across Colorado had to tackle a big 3% grade up to Tennessee Pass. But their narrow gauge routes were even tougher: many mountains had to be crossed with 4% grades. One of these 4% grades is still tackled every day by the Cumbres and Toltec Scenic Railroad. The Southern Railway had a route (now closed) that climbed Saluda Mountain at 4.7%. The steepest mainline grade in the U.S. was the Madison Incline, pulling out of the Ohio River Valley at a whopping 5.89% grade. The Cass Mountain Railroad had a maximum grade of 11% where Shays were used to pull empty log cars up the mountain and loaded ones down. You can ride the same route today. There are a few cases of railroad grades even steeper on which locomotives climbed with the help of geared rails (cog railroads) or cables (often called planes). The Mount Washington Cog Railroad has a maximum grade of 37.5% and still uses steam engines. The Mahanoy Plane of the Reading had a 22% grade and pulled one or two cars at a time up or down the hill. It was eliminated in the 1930�s when the railroad built a long tunnel instead. More horsepower - Trains are dispatched with more horsepower per ton of train. Big modern engines are now producing 4400 horsepower each, often running in sets of two or three. In the steam era, railroads built extremely powerful locomotives for tackling the mountains, with as many drivers as possible. Many used articulated engines, which used two sets of drivers, one able to hinge on curves. (A Mallet is an articulated locomotive that uses steam twice, so the front cylinders are extremely large. It�s also relatively slow.) Once the trains were up and over the mountains, they could be reassembled into longer trains with faster engines. Helper service - Freight trains get helper engines in the rear of the train (pushers) or sometimes in the middle of the train (swing helpers). Nowadays on heavy freight trains, helpers are often used downhill as well as uphill because the extra engines provide more dynamic braking, which is safer and more economical than relying on train brakes. Passenger trains and intermodal trains often do without helpers, but when they have one it�s usually an extra engine in the front. Railroads dislike the expense of helpers, so many helper districts have been eliminated. But several will be around awhile: Horseshoe Curve (PA); Sandpatch Grade (PA), Donner, Tehachapi, Cajon, and Dunsmuir (CA); Moffat Tunnel Route (CO), and Stevens Pass (WA). Doubling the hill - In remote areas, or where there aren�t enough trains to justify a helper, train crews will double the hill. They split their train in two at the bottom of the hill, take half up the hill, leave it on a siding, go back down the hill, pick up the other half, and reassemble the whole train at the top of the hill. Rebuilding the route�Railroads try to reduce grade and curvature by building tunnels through the mountains and crossing valleys with bridges, trestles, and fills. Rio Grande�s Moffat Tunnel is over six miles long and there are several even longer. A tunnel is now being built under the Swiss Alps that will be over 35 miles long! Southern Pacific avoided the original transcontinental route through the Promontory Mountains by building a long trestle all the way across the Great Salt Lake. The Virginian had far fewer tough grades than the Norfolk and Western because its route used many tall steel trestles to cross valleys. Flat or minimum grades for continuous running, such as open houses, modular displays, show layouts, etc.�This creates less wear and tear on locomotives, less current required from power packs, less drain on batteries, and is easiest to run when you can�t pay full attention to the railroad. Also, for live steam railroads, flat trackage is very important unless all the engines have remote control. 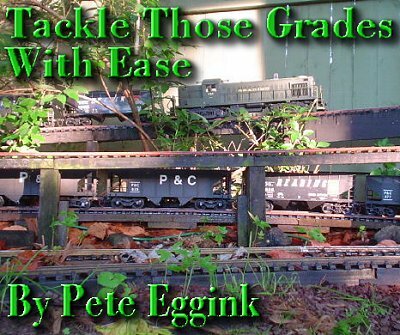 Moderate grades on main lines for adding interest to the scenery, looping up and over, or building track without too much extra shoveling and moving of dirt and rocks�I recommend no higher than 2% grade whenever possible. Steeper grades for specific operations: You may want to see how many cars your favorite engine can pull before it starts to slip. You can justify that Mallet or Dash 9 because you need the power to climb a grade. Or you may want to build a helper district where operators must use helper engines. You may want to build a logging operation that climbs a mountain and justifies that new Shay or Heisler. 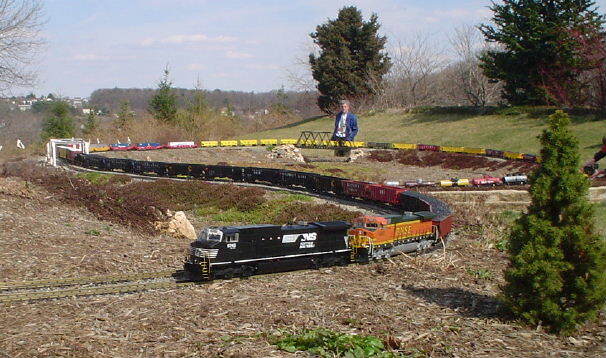 In some cases, a garden railroad is built on the side of a hill, which means steeper grades may be necessary. 5% is not unreasonable for smaller trains and straight track. But if your trains are winding around curves, it�s best to keep the grades down to 3% or less. 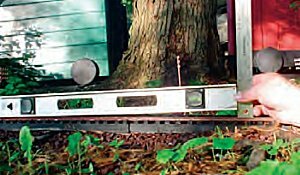 Looping up-and-over�Most standard gauge garden railroaders (running 1:29 or 1:32 trains) consider 9" clearance between crossing tracks sufficient. If you use curves only, a ten-foot diameter (five-foot radius) track loop would require a steep 2.4% grade to loop over itself with a clearance of 9 inches. The math for this would be rise (9") divided by circumference (377"). To find the circumference multiple the track diameter in inches (120") times Pi (3.14) . If you have more room, the news is better. A 20-foot diameter (ten-foot radius) loop can climb 9 inches at a moderate 1.2% grade. (Circumference is 240"xPi=754". Divide 9" by 754" and you get 1.2%.) With such a railroad, a train 63 feet long would easily be able to loop over itself. 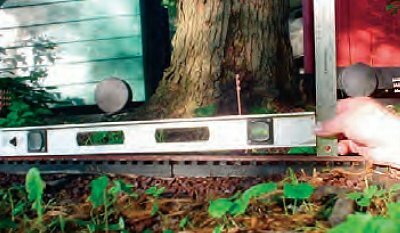 For 12" clearance, the amount some 1:20.3 narrow gauge trains fans use as a safety margin, the grade would be 1.6%, still quite "doable" for most kinds of railroading. Here�s a quick-and-easy method to measure grades. Take a 24-inch level and a set of �-inch shims of wood. Set the level on the track and raise the lower end with the shims until the bubble�s in the center. One shim is 1%, two shims are 2%, and so on. With the level�s bubble centered, the track rises 18.3 mm. So the grade here is 3.0%. You can see that planning and calculating grades is pretty easy. And you have some idea of what you can "get away with" for various kinds of trains. Best of luck with your planning. If you want to get ahold of me, contact Paul, and he'll forward your e-mail.